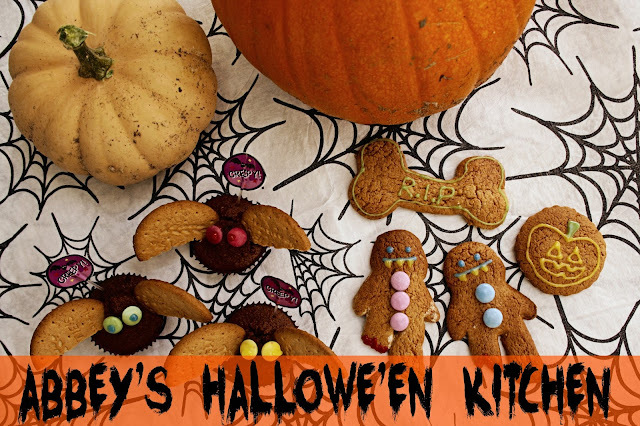 Hello and welcome to Abbey's Hallowe'en Kitchen! Dare you enter to discover the devilish delights I've cooked up for a spook-tacular extravaganza? Today I'm going to how you how to adapt a couple of easy, everyday recipes to create some simple but oh-so-effective Hallowe'en goodies. 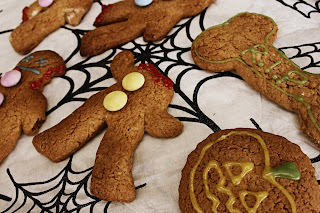 If you're hosting a Hallowe'en party, or whether you're making some snacks for trick or treaters, I have the perfect recipes for you! This is also a collaborative post with the wonderful Abbie from abbiechic.com! We've teamed up to bake some scrumptious Hallowe'en delights this month, and she's going to show you how to make a no-bake cake! Click here to read her post. For my first trick, I will show you how to magic some chocolate muffins into a set of creepy bats! The recipe that I used for the chocolate buns can be found here, but if you don't have time to make the buns yourself, you can simply pick up a pack of plain cakes from the supermarket and decorate them as follows. Grab a pack of digestive biscuits and break a few biscuits in half. Then cut a couple of slits in the top of your chocolate bun and poke the corners of the biscuit halves into them. These will form the bats' wings. Next grab some writing icing (I used this set from Tesco) and use it to stick on a couple of Smarties for the eyes. I added some pupils using more of the writing icing. To finish with a flourish, I popped in the 'creepy' cocktail sticks which I picked up from Poundland. And there you have it - your bats are ready to eat! Next on the menu is some ghoulish gingerbread! 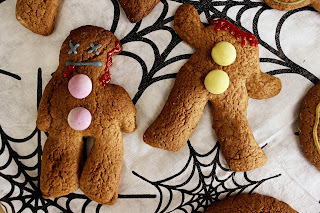 I followed this straightforward recipe to whip up the dough, and after I had cut out my gingerbread men, before putting them into the oven I mutilated them slightly by pulling off their heads, chopping off their legs, and cutting a few chunks out of them! 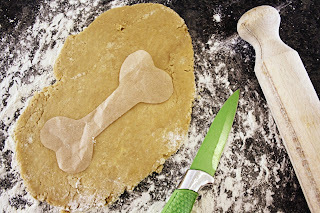 I also created some bone shaped biscuits, and some simple round shapes. When they were cooked and cooled, I used the same writing icing as above to stick on some Smarties as buttons, draw on some fiendish expressions and give them some bloody looking wounds! I had waaaay too much fun doing this, and the end result was pretty effective! If you want to make some creatively shaped gingerbread men to add into your mix, but you don't have the right kind of cookie cutter for the job, don't worry! You can cheat your way to perfectly shaped biscuits every time! For this, cut out your desired shape on a piece of greaseproof paper. Then place it over your rolled-out dough, as shown here, and cut around it with a knife. With this technique, you can create pretty much any shape imaginable with your gingerbread without having to shell out for any new cooking equipment! It's a win-win! 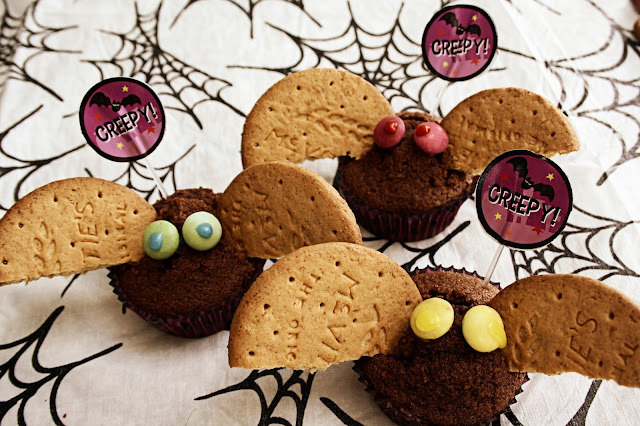 What are your favourite Hallowe'en treats? Comment below! If you decide to try out any of these creative bakes in your very own Hallowe'en kitchen, please tweet me a photo or tag me on Instagram! And don't forget to check out Abbie's post, here.